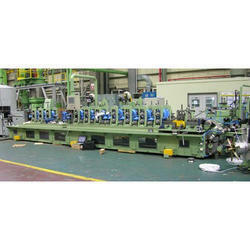 We offer several standard models of stain­less steel tube making mills. The various lines can make tube thickness from 0.3mm up to 12.7mm, tube OD is 6.5mm up to 508mm. Keeping in mind ever-evolving requirements of our respected clients, we are offering a premium quality range of SS Tube Mill. Stainless Steel Tubes find applications in selected sectors such as Food Processing, Pharmaceuticals, Dairy Products, Chemicals etc. We are the manufacturer of stainless steel tube mill to our valuable customers. These stainless steel tube mill is provided by us at very reasonable price. We offer wide range of Tube Mills for Stainless Steal Tube forming for round and various profiles with the help of Turk’s Head. Tube Mills have set of rotary Turk’s Heads for precise straightness and roundness. These welded tube mills are available in different specifications as per customer’s demand. We are a most trusted name among the topmost companies in this business, involved in offering Stainless Steel Tube Mill Machine.